They have only just landed and Malcolm Dome has already said "Space Elevator could just become the most successful hard rock band of the year" in AOR Magazine. All songs on their album are co-written by lead singer, The Duchess, and guitarist, David Young. Vocals, guitar, keyboards and rhythm section work in perfect harmony to create a new and distinct sound. 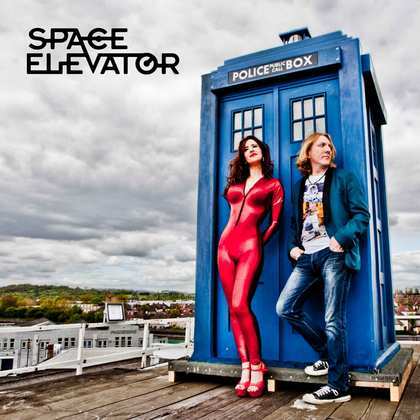 Space Elevator draw inspiration from the greats of the rock world – Kate Bush, Queen, Genesis, Fleetwood Mac – and bring the sound of the 1970s/1980s to the present with a modern twist, in a way that no other rock band has done. A real rock song, with a retro 80’s sound. It’s a dramatic, overblown song with well crafted lyrics – about being in a relationship but feeling totally alone and powerless within it. The instrumental is strong – electric guitar and drums building up to the “loneliness of love” chorus, that the Duchess sings with great anger and passion – she owns this song, representing fantastic woman power. Think REO Speedwagon crossed with Heart. A fun, quirky song, that shows the range of this talented band. It’s about a woman’s obsessive relationship with bubble baths! It’s catchy and creates a unique sound, that will very quickly have you singing along. There’s a beautiful piano intro, harmonising guitars, and wonderful piano-based verses. The Duchess shows a playful side to her voice and we get the impression that she will keep us guessing over what the style of the next song will be. Watching The Duchess perform with such flamboyant energy and power, you know that you’re in the presence of a real artist. Performing only in eye-catching cat suits uniquely designed for her, the Duchess quotes as her influences some of the greatest showmen in the history of Rock, Freddie Mercury, Steven Tyler, Robert Plant and David Coverdale. The Duchess presents a new kind of showwoman, that the world has not yet seen. And not only is she a captivating performer but her vocal range is outstanding both live and recorded.